Our 2019 calendars are selling fast! 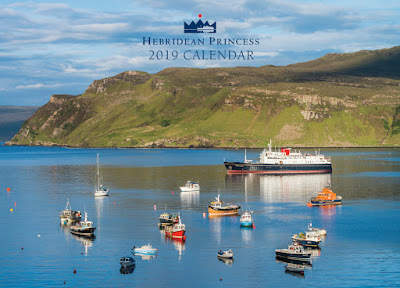 Ideal as a present for family or friends, or as a little treat to yourself as you count down the days until your next Hebridean Princess cruise, they are priced at only £10. The calendar contains a stunning selection of scenic shots, wildlife, iconic landmarks and images of the ship which capture the beauty of landscapes and the natural world of Hebridean Princess' home waters. Many of the images were taken by guests, such as this lovely autumnal shot by Geoff Dixon taken near Inverie, Loch Nevis. Please call 01756 704704 or email reservations@hebridean.co.uk to order your copy.